Disturbed is one of those bands who made it big in the early 2000 along with a whole bunch of other nu-metal acts. But I never saw them as nu-metal per se, I feel more comfortable calling them modern metal or something like that. Their sound is far away from the oh so dull metal / rap thing that goes along with all the Limp Bizkits and Linkin Parks of this world. And Disturbed are so much better than that. Their brand of Metal is aggressive, hard and dark, but at the same time groovy and melodic with lots of catchy hooks. They have also managed to find a sound of their own, which is not the easiest thing nowadays. Now, their two first albums The Sickness (2000) and Believe (2002) spawned some really cool tracks, but for me it was with their 2005 killer Ten Thousand Fists that really got me hooked on the band and its follow up Indestructible from 2008 was even better and those albums really made Disturbed a huge band all over the world, not only in America. So to follow up albums like those creates some big pressure to deliver the goods. So did they do it this time as well? Well, the title track, ”The Infection”, the anti nazi song ”Never Again” and ”Warrior” are the tracks that got my attention right away, but they are far from the only really good tracks here. There is also, again, a cover version here. Before they have recorded really cool covers of Tears For Fears’ ”Shout” (on The Sickness) and Genesis’ ”Land Of Confusion” (on Ten Thousand Fists), the latter a real killer and this time they took on U2’s ”Still Haven’t Found What I’m Looking For”. Brave move, but unfortunately this one doesn’t work at all. Where the others were “Disturbedized”, this one is too close to the original to work. Besides, I have always thought that the original is a really dull tune. 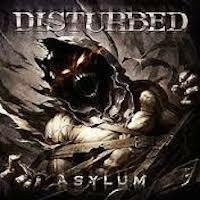 I really don’t get it why they didn’t make a Disturbed song out of it. Other times it feels like Disturbed has painted themselves into a corner musically. Or maybe they just feel very comfortable within their comfort zone because I get the feeling that many songs are created within a formula and that the band has a hard time reaching outside of the box. This is a good album, BUT with this CD they have taken their style as far as they can and it just isn’t as strong as its predecessors. For the first time many of the songs sound too alike and sometimes you get the feeling that they are nicking things from themselves. So for the next album they need to develop and move on a bit, find new ways to their music without changing who they are. Maybe a ballad? But for this time, thumbs up but they need to think things through and decide which is the next step to go. Kiss released an album back in 1985 called Asylum and it is one their most roasted albums to date. let’s hope that that doesn’t happen with Disturbed’s dito.